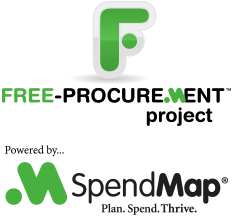 There seems to be some confusion about multi-user access to the free version of SpendMap. We’ve had quite a few questions about upgrading to the (paid) web-based version of SpendMap in order to have more than one person using the system at the same time, but upgrading is often not necessary. So to set the record straight, in this post I’ll outline how you can install your free Purchase Order Software on a network server for multi-user access, and I’ll also outline the additional benefits of (optionally) upgrading to the web-based version of SpendMap. So for the record, “web-based” and “multi-user” are not the same thing. The free (Windows/desktop) version of SpendMap can be installed on your server, and you can roll it out to as many people as you want. Each user will run the software on their PC workstation, while accessing the shared database on the network server. So when someone creates a Requisition or a Purchase Order or whatever, other users will be able to see and work on the order as well (provided you give them the ability to see other people’s orders). So why do I need the web-based version of SpendMap? If you’re working in a small business or a small buying group of a larger organization, you might not need a web-based e-procurement system. If you don’t mind setting up software on each PC workstation, then our free Purchase Order Software might certainly be enough for you. But if lots of people need to access your Purchase Order System, then you might consider upgrading to the web-based version, which runs inside your web-browser, so your staff can access it from anywhere, without having to set up software on their PCs. So for most companies, it comes down to ease of deployment. While there are some other benefits, in general the more users you have, the more benefit there is to upgrading to the web-based version. But if you don’t have too many users, then the free version is probably all you’ll need. And yes, you can start with the free version and upgrade to the web-based version down the road if you like, with no loss of data…everything in your free version will be brought forward automatically, including Master Files, settings, Purchase Orders and other transactions, etc.